For other updates about Elvis see Fans Of The Man Elvis Stojko Yahoo Group where news updates are posted directly from news sources. Way to go, ELVIS! You're doing a great job. Keep it up. Get some rest, talk with Glen and have lots of fun. You all know what Elvis did for Canada in Nagano. The Webmaster's Head Tripping Quotes. THIS IS HOW I SEE ELVIS STOJKO. Listen to the cd Plastic World which Elvis has a copy of. Books, search engines and webrings. Let's keep praying for Elvis Stojko and his family. You can post ElvisPrayers here. Elvis has persevered through a long season of competitions on his road to recovery from a painful injury that almost ended his career. Once again, he proved to us that nothing is impossible when you have a dream. Elvis' dream lives in children who are dealt with daily by RMCC (Ronald McDonald's Childrens Charities). In honour of Elvis and his strength, courage and true mettle in the face of seemingly insurmountable odds, please make a donation to RMCC and give to the kids Elvis is trying to help live their dreams. It doesn't matter if it is $1, $5, $10, $20 or $100 it all helps. On the memo line of your cheque please write The Elvis All Stars. Sharon's friend at RMCC will know to keep the cheques with this description separate. We will then tally the total money near the beginning of August and present Elvis with a certificate stating the dollars raised by the fans at the Mariposa Gala in Barrie on August 12th. Please give...let's help our champion help the children. If you have any questions or concerns please e-mail Sharon at stevens1@execulink.com Thanks and God Bless. Elvis on Chistmas Special on TNN.. Joining him will be Nancy Kerrigan, Philippe Candeloro, Isabelle Brasseur and Lloyd Isler, Surya Bonaly, Hartshorn and Sweiding, Rudy Galindo and Tonia Kwiatkowski. This unique event has the country stars Sawyer Brown, Billy Ray Cyrus, Lorrie Morgan and Sherrie Austin performing live. Tickets are $50 and $35 for the live event in Nashville. What he did for kids in sports. You all know how Elvis showed that it is not if you win but if you display a winning attitude no matter what comes your way and not to give up that matters. You still can tell the ISU how you feel. "Pain is short-lived, but Pride lasts a lifetime"
"Sometimes you don't always get what you want. You get what you need." "God gave me a gift to do this and I want to take it to its limit, and I know I can." said on Sept. 8th, 1998. Our hearts are with you, ELVIS. 6 time Canadian Champ!...Hope you have lots of fun on and off of the ice. Love your skating, Elvis!!! they will stay fresh and green. holding on to faith and a good conscience. "Everything that is worth it takes time to get." We have to go for it no matter what the cost." it is not easily angered, it keeps no records of wrongs. Fans of the Man Fan Club. It's free and only online. The email links now work. Sorry for the inconvenience. Elvis fans read the Twelve Days of Elvis"
It's a Christmas treat made by a fan of Elvis. Read Steve's and Brent's commentary on the race between Elvis and Todd and then vote for your winner. Read the results from the race. Elvis Stojko's 2000 Freeskate Elvis Stojko's Freeskate; Star Wars or Mummy? Elvis' Competitions for 1999 and 2000 season. Make all the media sources write a retraction. Sue the pants off the media. Give the media a press conference to set the media straight. Work extra hard in the next year to prove the media wrong. Blue Mountain Arts' Eletronic Greeting Cards be sure to use this email cfsa@cfsa.ca and place Elvis Stojko in the recipient name box. Elvis loves to skate. It is his passion and his job. You can tell, especially this year, that he loves to skate because of his smile and his contact with the audience. You can see his joy for figure skating shine from his heart to his eyes, his smile, his other facial glances and through his artistry. And anyone who would put in so much foot work, which would make others pass out from exhaustion, has to love figure skating or they're insane. Plus, he spends an unbelievable amount of time in practice everyday on his figure skating. Let's say, he lives at the rink. Here is what I posted at CNN/SI in their message board to defend Elvis and his skating. I just had to defend Elvis and his style of skating after most of the posts at CNN/SI were bashing Elvis. "To me Elvis Stojko is the best skater in the world and always will be. He may not do what most judges so far call classical artistry, but he is original. Elvis brings a unique style of artistry to skating. He shows what is in his soul and heart by his intricate footwork and his precise timing of his jumps to the accents of his program music, no matter if they are for competition or just for exhibition fun. Elvis doesn't need to put over done arm movements to take away from what his feet are doing on the ice. Plus, Elvis has those cool jumps, like his quad toe loop/triple toe loop combo, which 99% of the time, he does to a perfection. Toronto -- Quietly, and carefully, three-time world champion Elvis Stojko is working himself back into fighting shape after an injury that hobbled him at the Nagano Olympics. Stojko, of Richmond Hill, Ont., has been landing triple Axels for the past several days, according to the figure-skater's agent Ed Futerman. He began training again the last week in June, and now has all of his triple jumps back in his repertoire. He has not yet tackled a quadruple, the jump that made him famous. Stojko has not competed since the Olympics, when he won a silver medal in spite of a painful groin injury and a virus that swept the athlete's village in Nagano. He was unable to defend his title at the past world championships in Minneapolis because of the injury. But in spite of a frustrating wait for his body to heal, Stojko is moving ahead in his training, and is "in a great frame of mind," Futerman said. "He's looking forward to the fall." Last week, Stojko won a special award honouring his service to Canada, in light of his Olympic effort. It came as a complete surprise to him, Futerman said. "That made him feel awful good." On Sept. 8, Stojko will hold a news conference to announce his plans on whether to turn professional or remain in the Olympic-eligible world, and to talk about his annual Canadian skating tour. Should he remain in the eligible ranks, he will have no difficulties signing an athlete agreement with the Canadian Figure Skating Association, Futerman said. "We have no problems with the contract as it exists." Futerman said he made it clear, however, that the CFSA may use Stojko's image only as a member of the team, not as an individual. But he added that he recognizes the skating association's need to seek sponsorship agreements to build the sport, especially at a time when governments are cutting support to amateur sports. The CFSA does not require any of its athletes to wear its sponsor logos on their team uniforms. "That's what makes [the agreement] fair," Futerman said. Should Stojko remain an eligible skater, the CFSA has pencilled him into Grand Prix competitions at Skate America in Detroit from Oct. 29 to Nov. 1 and Skate Canada in Kamloops, B.C., from Nov. 5 to 8. Although the International Skating Union has not yet released its list of competitors for the six-event Grand Prix Series -- the deadline for changes is today -- The Globe and Mail has obtained a preliminary list of event rosters. According to the list, Stojko will meet current world champion Alexei Yagudin of Russia and 1994 Olympic champion Alexei Urmanov of Russia at Skate America. The field is a little softer at Skate Canada, where Stojko could meet quadruple-jumping teen-ager Evgeni Plushenko of Russia and former U.S. champion Scott Davis. Young Japanese star Takeshi Honda, who landed a quadruple jump at the world championship, also is scheduled to come to Skate Canada. 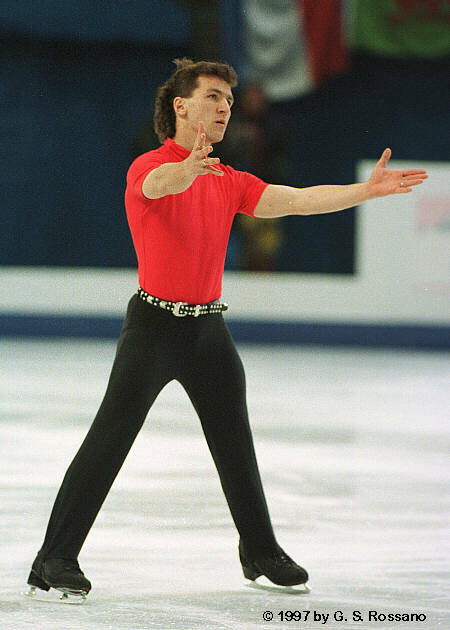 Stojko to go for fourth world title Alright Elvis, you truely are the King of the Ice. Wow!!!!!!! Elvis, you did great!!!!! Stojko Impressive at Skate America Elvis is in second place with our favourite Lion short program. Can Elvis reign long road? He started out strong but after 2 and 1/2 minutes the program began to take it's toll. Elvis began to slow down and looked worn out, but I sure give Elvis credit for trying his best at the moment. You could tell his mind said "Go, go but his body said no, no". At first he tripled his jumps and then began to double his jumps. Even when Elvis was spinning you could see the pain on his face that he was trying to hide. Merlin's powers were not strong enough to hold Elvis up onto the podium. A respectable fourth place was all Elvis got. How many skaters could have come back so soon after the injuries Elvis got from Canadians and Nagano? No one. Not even 3rd place Alexie Urmanov could muster what Elvis did at the Joe on Oct. 31, 1998 in the time span that Elvis had to recover and make a come back. Elvis has got to be the skater with the most guts in history. First Thursday, Oct. 29th, 1998 he almost pulls off a quad in the short. (note: That would have been a first no matter if he was injured or not.) Then the short time span to recover for Skate America. Is Elvis great or what? I think so. Alexie Yagudin came in 1st winning gold but not the points because Skate America was not a point event for him. Michael Weiss won silver and like I said before, Alexie Urmanov stole the bronze from Elvis. Hey I was trying. Yes! Elvis landed the double axel and the triple lutz clean but he two footed his toe loop on his axel-toe loop combo. For where he has come from, he was great. If you are in Kamloops for any of Elvis practices before the long program, give Elvis some bananas because bananas are loaded with patassium which can help with his stamina. I wish I had the bananas to give him at Skate America before his long program. If Elvis would eat one banana five minutes before his Merlin program, he would be able to get through it better. Elvis was beaten by the quad that he usually does flawlessly and a sixteen year old Russian kid. Elvis really improved alot from Skate America last week. I just hope that the judges buy into his Merlin program by worlds though. Anyway, if you think that landing a quad is easy, it's not and try to do that with a recovering groin injury is even harder. Slowly but surely Elvis will be not just on the podium like he was on Saturday. He will be on top of the podium. Way to go Elvis. We all love you. King Elvis' reign over? Not until Elvis says so, Steve. You know that Elvis will push and hunt that Gold medal down like a true hunter on a wild hunt ready for the kill. Sometimes, you need to work up to the kill slowly because if you don't the prize runs away. At a Toronto press conference featuring Canadian national champ Elvis Stojko and Witt -- both promoting the Elvis Tour of Champions at Maple Leaf Gardens, both Stojko and Witt said they support Orser and wish his private life hadn't been dragged into the spotlight. "If someone chooses to be private it should be respected." Stojko said he'll never give up faith in Orser. "We all choose and we're all individuals. If that's the way he is, that's fine," said Stojko. "I've trained with Brian for many years, and he's a friend of mine. It's unfortunate and unfair someone's private life has to be put into the papers in front of the world." "The skating community is going to be there. I've always been there for Brian and I will stick by his side. "He's helped me so much along the way." Stojko said things are changing, noting: "I get a lot of guys who watch football, who watch hockey, guys that watch baseball come out and say: 'I've never watched skating before, but I like what you're doing.' "That means a lot to me." Fans crown Stojko Ice King That's why this page is called Elvis Stojko King of the Ice. Elvis Comes Back With A Lot Of Witt Ha ha, good pun press. Disturbing news everyone. Elvis has RE-INJURED HIS THE GROIN AREA AN HOUR AND A HALF BEFORE THE SHOW STARTED at his last stop of the Canon Tour and didn't skate at all in Hamilton but told the crowd of his doctor not allowing him to skate if he wants to salvage his skating career. He was almost in tears while he told the crowd at the Collosium in his running shoes. You can send Elvis an electronic greeting card through the link below. It's a shame, cause Elvis was doing so well in his comeback too. Don't forget to pray for Elvis to heal up and to not to get depressed. From Steve Buffery of the Toronto Sun, Close Call for Stojko Thank you, Mr. Futerman, Mrs. Stojko and the rest of the Stojko gang who kept Elvis from hurting himself worse and made him see the light. We fans appreciate it cause we love Elvis. Thanks. Sandhu could cost Stojko final spot Maybe for the Grandprix but not Canadians or Worlds. Elvis will be on top. Much ado about Stojko Keep doing your thing Elvis. We love you. Elvis Stojko, our three-time world champion, who did not compete in Sapporo, was commentating with Barb Underhill at the Sears Figure Skating Open in Kitchener, Ontario this weekend, found out from Barb while on TV that he also qualified for St. Petersburg. The top six in the standings will be in the final. Our Elvi's 14 points from a second (9) at Skate Canada and a fourth (5) at Skate America, put him sixth in the final standings. SEE, GOOD THINGS COME TO THOSE WHO WAIT. Wouldn't it be a hoot, if Elvis won the Grand Prix Final, even though he qualified with the least points? Show from Elvis' Recent Tour to be Shown On CBC Info near end of article. Elvis, even though you are skating to All Alone for your short program, "You've got to remember you're not alone in this world. Always remember, you're not alone in this world." Return of the King? Like Elvis ever left? Come on. Elvis will always be the King of the Ice! Sandhu threatens Stojko's reign It could happen to anyone. Like Elvis said "It was fluky." Eh, Jenny way to go! I told you you could do it. ISU will grant Stojko his bye This is great news. Now Elvis can rest up after 4CC and be 100% ready for Worlds. Yippy! Elvis in third at 4CC? What happend? Ah, it doesn't matter. Elvis still can win from third anyway. Our guy (Elvis) will give the knock out blow tomorrow. Stojko loses tuneup to worlds So what, Elvis had fun performing anyway and who says he's got to stress out his body for a competition that's only practice anyway. Worlds is where it's at and even if he doesn't win worlds, we should still love our guy for doing the best he can do. Groin and abdominal injuries are tricky injuries to compete with. They are like a box of chocolate. You never know what your going to get. Good try Elvis! We appreciate the effort. Not the King this night but Elvis was a proud big brother to Honda and showed is good character. Now, that's a champion. Stojko to enter pro-am Ticket info for Hershey's Kisses Figure Skating Challege If a web site with the result is made, I'll post it here. Elvis will appear on the Today Show on NBC Friday, March 12th. I'm not sure what time, so you'd better get up early and have you VRC and a tape ready. I am. Also, Elvis will appear on CBC's That's Skating at 8pm EST which tells the history of Canadian figure skating. Elvis isn't skating on the show unless it's from a taped segment from a previous year. He couldn't because firstly he had to take a break for his groin to rest for Worlds and secondly he got a bye from the ISU to miss the Grand Prix Final. Elvis' Lion program is back. Yeah!!!! Love that program and Elvis quick feet. He'll be doing it for Worlds. Hope Elvis keeps All Alone for exhibitions. Stojko ready for the world I guess this one is different for the last article. In the nick of timeStojko ready to take shot at fourth title I just hope Elvis remembers to have fun too. Healthy Elvis is a blues man no more Like we Elvis fans online didn't know this last week. Firstly, a immense Happy Birthday Elvis!!! Stojko advances What a nice birthday present for Elvis, eh? Stojko's chances of fourth title are slim Yeah, but could anyone else come back so soon and place so high with only 10 days of feeling no pain from the injuries Elvis has had? No. Elvis is still the Champ no matter who wins! Elvis has won against his injuries. Slinger made this up but it was a good laugh. ROTFLOL There is one thing he should know. Elvis is no wimp and that's how he protrayed him. I hope he apoligizes to Elvis about it. Elvis did just fine at Worlds placing a respectalbe 4th after a painful season trying to heal and complete. Just you wait to see how Elvis did at the Hershey's World VS the US competition that's on ABC this Sunday at 2pm EST which is two hours long. You'll be surprised. All Elvis needed was a little more time. I hope Elvis chooses to stay amateur but it's his decision. Here's a reason Elvis may like to stay amateur instead of turning pro. In an article called Survival of the Fittest ( The Secret is Exercise and It's Never to Late) which was condensed from Health May/June 1993) written by Steve Fishman, which I read Wednesday at physio while getting treatment on my groin, hamstring and ankle in the July 1995 issue of Reader's Digest, it said that exercise keeps you from aging fast and keeps your aerobic power up which adds to life expectancy. And with the way pro's don't do as much as the amateurs or watch their diets as well, Elvis would be making a healthy decision if he chose to stay amateur. He would be adding quality life hours to his life, where if he didn't he may end up in an old age home when he's in his 70's in a wheel chair. Ever wonder why so many people get to an old age home in the first place? In activity. Stojko second to world champHey Elvis I have an idea, give some of the power in your legs to the rest of us Canadian Sakters. LOL Like that could be done. Enjoy the rid, Elvis! Stojko second at Grand PrixElvis did a great job on the 4 hours a night of sleep he got in Lyon, France. Enjoy the rid, Elvis and get enough sleep for your next competitions! Elvis Stojko will be waking up this morning to get ready to head to Japan for the his second 4 Contenents Cup. This time he'll be skating healthy, with artistry not seen before, with maybe a quad toe/triple toe/double, with a quad lutz and with a lot of power. Let's just sit back and let Elvis take us flying at high speeds. Windsor, Toronto, South River, Gilbert, Small Town, Sydney, Moncton, Saxton, Cobble Hill, Astoria, San Francisco, Des Moines. Ontario, Arizona, New Brunswick, Pennsylvania, British Columbia, Oregan, California, Iowa. What techno song would be fun to have Elvis act out as if he were the person being sung about? What kind of clothes and/or costume would make Elvis look like a Techno Punk Rocker? Some outfit suggestions from fans. Of the techno tunes listed that Elvis has skated to, which one is your favourite? Elvis has a lot left he wants to do. Amateur competitions are more interesting and challeging. Need someone to root for. 2 more years, great technical and artistic talent. More time to work on presentation. Some of the reasons why fans want Elvis to go pro. He did all he could do as an amateur. He needs a new change. To see Elvis and Kurt skate agains each other again. The type of Quad fans would like to see Elvis try to master next. To those of you who chose the Quad Axel, are you trying to kill our Elvis? Elvis is making a new short program. What do you think Elvis will do? Canoe Slam Skating : Stojko Wins Gold Again, I told you so. Another picture of Elvis: This is what Elvis is wearing for his long program. 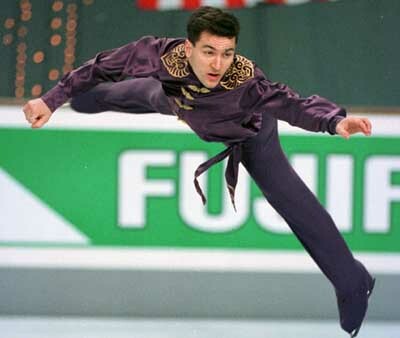 Canoe's Picture Gallery of Elvis Stojko: The many faces of Elvis Stojko, the best skater in the world. SLAM! 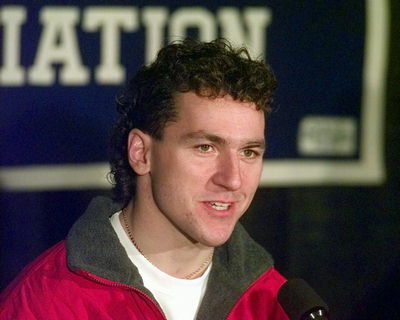 Elvis Stojko: Everything on Elvis Stojko, the best skater in the world. Reviews of Elvis on the Champions On Ice Tour. These reviews come from Elvis Stojko: Heart of a Champion. Elvis will always have a champion's heart. Stojko's Mom his No. 1 fan: Elvis, "She really believed that I was going to make it." Has video of Elvis doing 7 Butterflies in a row. Has video of Elvis doing a back spin. Lucid Sight Movie Gallery has an animated video Logo used for Elvis' Elvis Airborn. 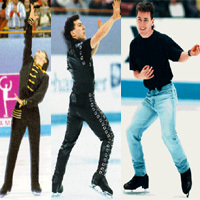 Elvis Sighting:Stojko wins gold medal Article includes Elvis' quad/triple toe loop combo video. Reel is a great place to look for videos on skating. Singerskates' ICQ Elvis Stojko Group also see, Fans of the Man Elvis Stojko in Yahoo Clubs. Listen to the cd Plastic World which Elvis has a copy of..
also Jennifer Robinson and Barb Underhill have a copy too. At the Plastic World of Nanosecond you can use RealPlayer, Quicktime or Mpeg to hear the songs. A form to find those figure skating books you always wanted. is owned by Brigitte Laskowski. Elvis Stojko's info has been hit times. This web page is owned by Singerskates.